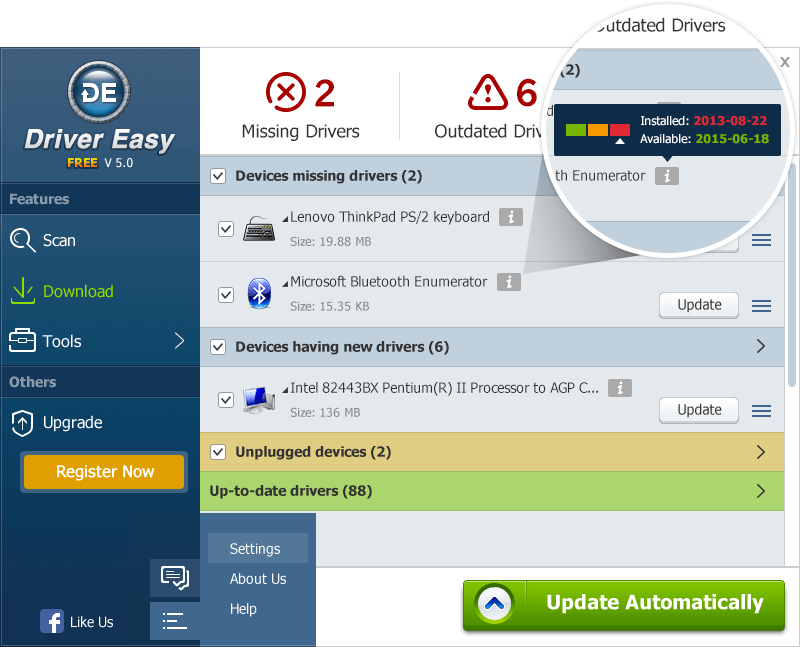 Driver Easy Version 5.0 is being in development. You can expect that it will be released in 1~2 months. Version 5.0 will be a lot different from the old versions. In order to make it easier for you to use, we have been spending more time in developing this version. You will see a new design, and many new features will be available in Version 5.0. Here we will show you some new features of Version 5.0 by comparing with Version 4.9.5. You will get all new features when it is released. This is the first time we make a big change to the UI design since Driver Easy was developed in 2009. In Version 4.9.5, you can see that the main menu has two portions. One is at the top and one is at the bottom. In Version 5.0, the menu is only at the left. Your attention won’t be disturbed. You can get all features by just looking at the left side. Besides, you can like us on Facebook, send us feedback in Version 5.0. With Version 4.9.5, you need to click three times to finish one driver update. With Version 5.0, you only need one click. For both versions, you will be directed to the download page after scanning completes, then you can download and install the drivers. 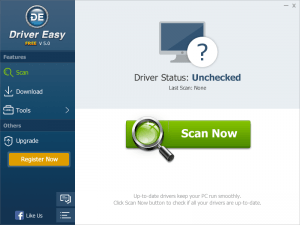 The main difference is that you can set a scan schedule with Version 5.0, then Driver Easy will scan your computer automatically. With Version 4.9.5, you need to click Scan Now button, Download All button, then Install button to update the drivers. With Version 5.0, you can just click Update button to update the drivers. Besides, you can get the driver version by just pointing the cursor to the driver name. You can also check the download process of each driver, even when you download all drivers at a time. Version 4.9.5 doesn’t have this feature. 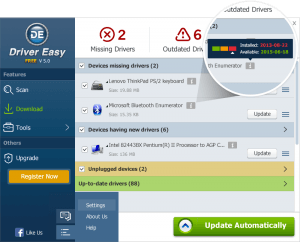 Your any ideas about Driver Easy Version 5.0 is greatly appreciated. We would take your ideas seriously, as your satisfaction is our first priority. We would try our best effort to make Driver Easy the best product for you.